The Holiday Inn Express Hotel & Suites Warsaw, IN - is ideal for the business or leisure traveler who is looking for an upgraded hotel that is economical. Our room mix includes Executive Kings, which offer an oversized work area, a desk phone with speaker capabilities and an additional line for computer usage. Our Spa rooms include a whirlpool and Queen bed. Extended stay suites include two Queen beds, living room area, and for your comfort, wet bar with refrigerator and microwave. New for the family, stay in our KidSuites featuring adult/family area including a Queen sized bed, 25' television with in-room movie system, clock radio, table and chairs, microwave, coffee maker and a mini-refrigerator. The KidSuites includes bunk beds, color TV with VCR, AM/FM/CD/Cassette player and clock, decorator telephone, and play table or kids desk. The Holiday Inn Express Hotel & Suites Warsaw, IN also features a Concierge Floor; an exclusive private floor in the hotel, access to which requires a Concierge Floor pass key to access. The Concierge floor has its own Executive lounge open Monday through Thursday evenings from 6:00PM to 8:00PM. 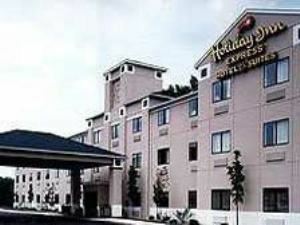 All rooms on this floor are Deluxe Executive Rooms or Suites and feature Sealy Ultra Plush pillow top mattresses. All our rooms amenities include: Complimentary expanded continental breakfast, free local phone calls, free high speed internet, daily newspapers, 24-hour coffee service, in room movie system, fax service and valet service. Norris Estate is a premier wedding venue that is located in Nappanee, Indiana. Norris Estate is unique and takes care of all your wedding needs! Our venue specializes in tented occasions with beautiful landscaping on 36 acres of land. A stunning cottage suite and mens hangout space is included with the venue. We offer custom floral design and specialty linens.